Chris Parker woke up at 6:00 AM and called the room to wake Bob Riskie and I up. Fifteen minutes later I met Chris downstairs and we walked to the Max 82nd Street Station taking the next train to the Lloyd Center Station. Bob would leave later for his trip on the Lewis and Clark Explorer from Litton to Astoria today. We walked over to the Doubletree where we boarded the bus at 6:45 AM and left at 7:00 AM for the two hour and fifteen minute trip to Elbe, Washington. On the way there traveled through Morton and I saw the station plus the railroad which we followed kind of to Elbe. When we arrived at Elbe our special train was being made up for our trip to Morton. The Mt. 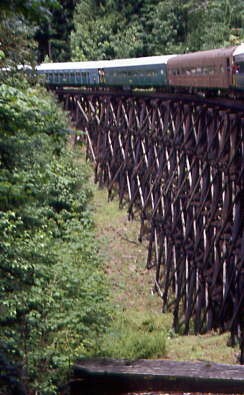 Rainier Scenic runs over the tracks built by the Tacoma Eastern Railroad Company between the years of 1902 and 1910. 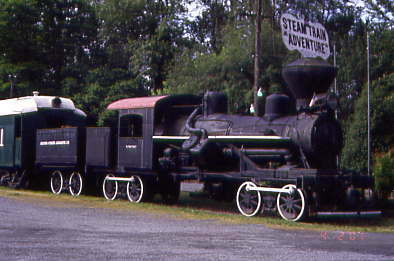 The railroad was incorporated on July 14, 1890. On December 31, 1918, while under the control of the United States Railroad Administration, the Milwaukee Road absorbed all of its subsidiary roads, including the Tacoma Eastern, into the Chicago, Milwaukee & St. Paul Railroad system. 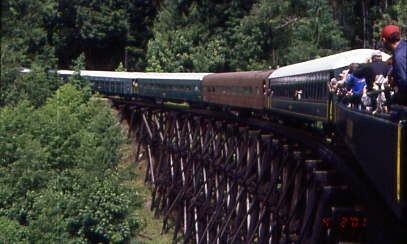 It was the only profitable branch on the entire Milwaukee Road Pacific Extension. 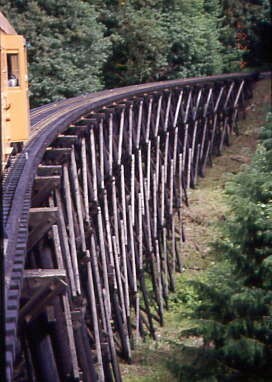 The CM&SP railroad was closed down in 1980, and many of the lines in Washington were abandoned, including this one. The Mt. 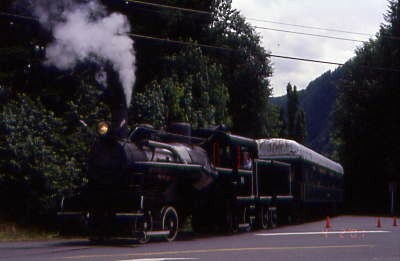 Rainier Scenic Railroad is based out of Elbe, Washington started running excursions in the summer of 1980. 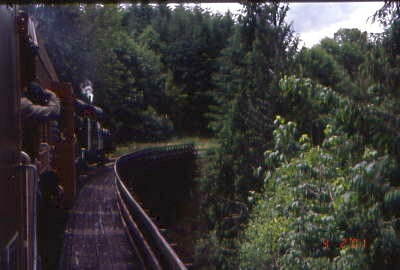 The line to Morton was not used as part of the excursion railroad and was essentially abandoned for about 10 years. 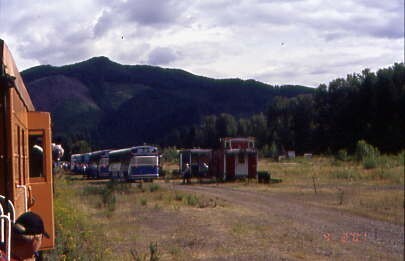 In 2003, for the first time, the Mt. 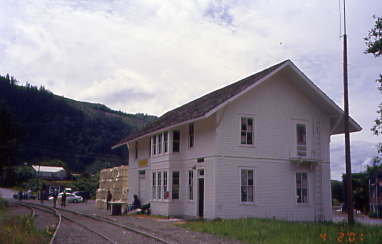 Rainier Scenic Railroad ran a train to the historic Morton Depot. 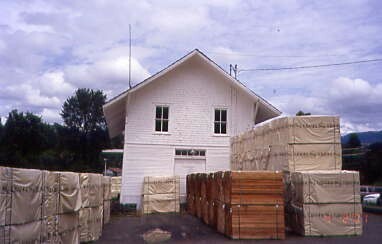 Hillcrest Lumber Climax 10. 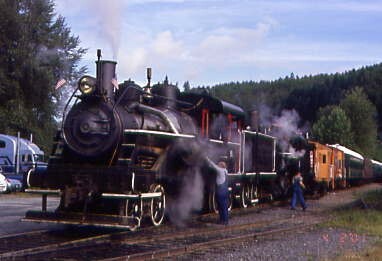 I had ridden behind this engine on Vancouver Island back in the early 1970's. 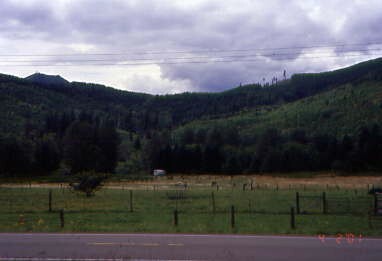 There is another Heisler on display out along Washington State Highway 70. 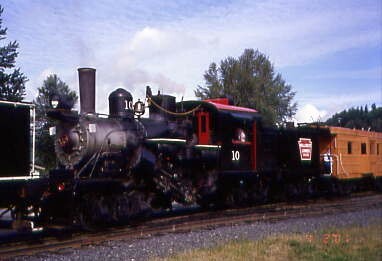 I learned that this engine is former Pickering Lumber Company 10 as a 3T Heisler and was built in 1912 for the Blue Jay Lumber Company in West Virginia. 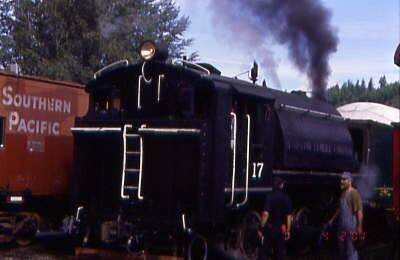 Hammond Lumber Company 17 was making up the normal excursion train for this Saturday. Our train backed then came forward into my view. 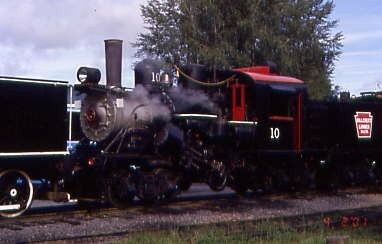 Our train running by the Hammond Lumber Company 17. 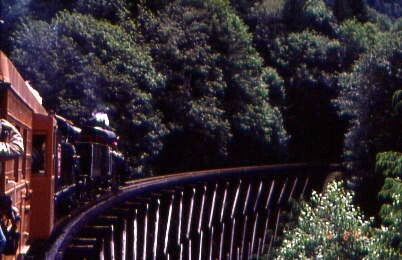 The Climax was an interesting locomotive not only to see but to also hear. 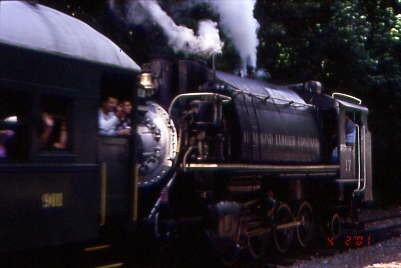 The engine crew of the Hammond Lumber 17 did a great inspection of this fine example of a steam locomotive. Our train sat ready for departure time. 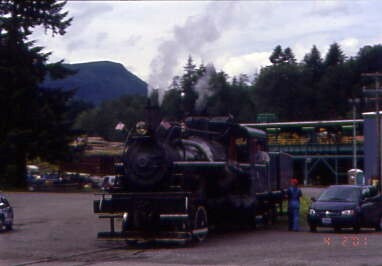 I visited the gift shop for a Mt Rainier Railroad T-shirt before I went to get on the train. My Park Bench Ticket allowed me to ride in the Southern Pacific Bay Window Caboose 1751. I rode the entire trip in the Bay Window. 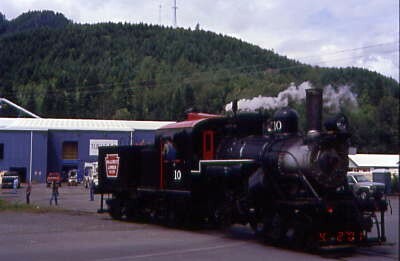 Our train to Morton had the Heisler 91, Climax 10, Milwaukee Road Caboose 00194, the SP 1751, Open Car 681, Coach 902 Mineral, Coach Darcy C85, Coach Morton N/A, Coach 584 Eatonville, Open Window 541 Cloper and Observation 100 Nisqually River. We left Elbe at 10:00 AM. 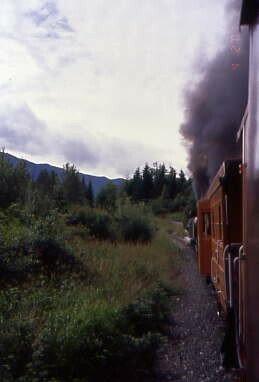 Our Train crossed the Morton Highway 7 before we passed through forests and by private residences. 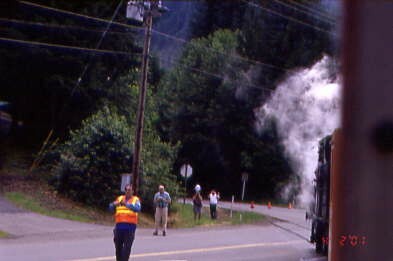 Near MP 47.5 there was a meadow where Joe Harper, the official videographer of this NRHS 2005 Go By Train Convention, was out filming our train's passage. 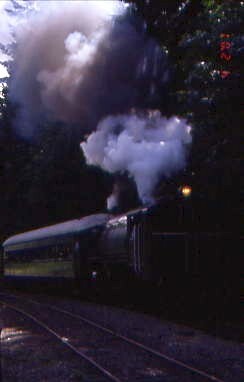 I sat in the Bay Window enjoying the smells, sights and sound of our double headed steam special. 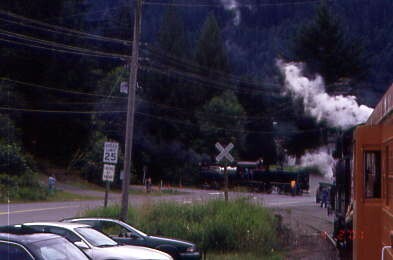 Minutes later, we reached Park Jct and turned south crossing the Mt Rainier Washington Highway 70 for the last time. 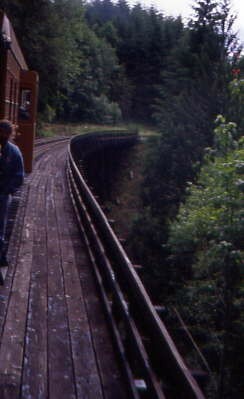 Our train crossed the first bridge across the Nisqually River. This bridge once carried the waters under the tracks until the river relocated its course in 1996 further south. 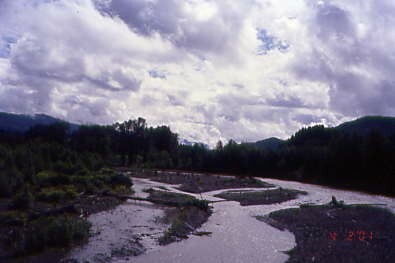 The crossing of the Nisqually River at the newer bridge. 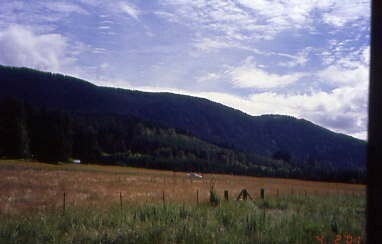 The view looking east up the Nisqually River. On a clear day there is a great view of Mt Rainier from this bridge. 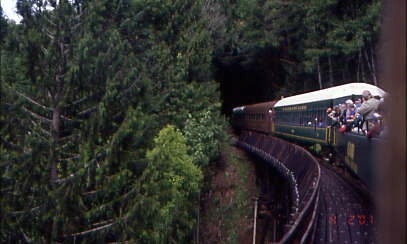 Our train passed through the very lush and unspoiled Washington forest as we followed Mineral Creek before we crossed over it a few miles further. 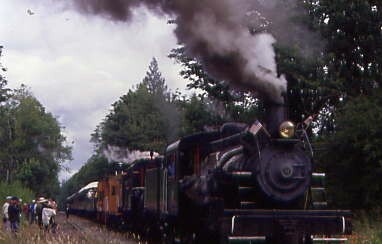 A spur next took off for the Mt Rainier Scenic Railroad shops just east on Mineral. 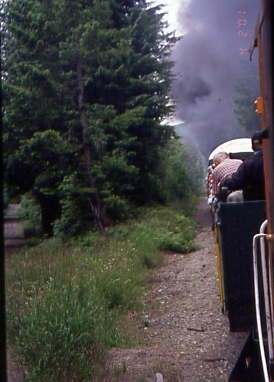 We passed through the Mineral yard where there is a balloon track for turning the regular excursion train. 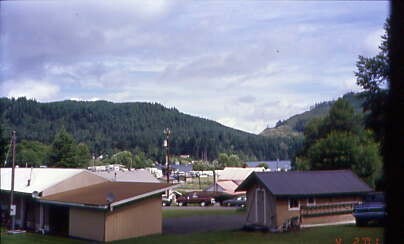 The town of Mineral with Mineral Lake behind the buildings and trees. 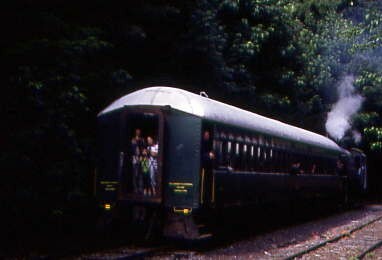 As we starting up the grade to Divide, here is a look back at our train. 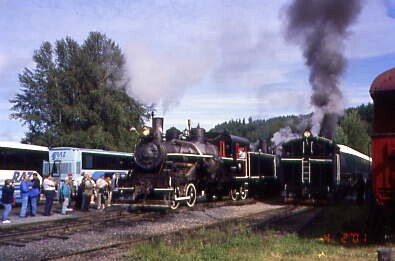 The train came to a stop to inspect the engines. Off to our left was a track that was relocated when a bridge was washed out and a new bridge was built. After about ten minutes we were off again heading to Divide. 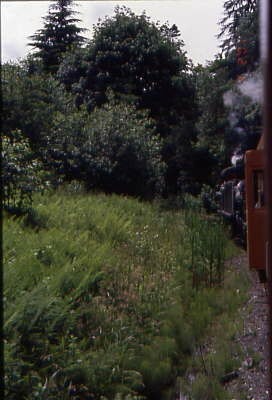 The engines worked hard as they climbed the grade towards Divide blasting the leaves off of the overhanging trees by their exhaust. 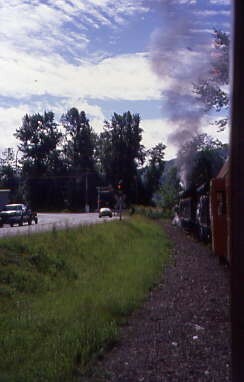 At Divide our train detrained for a photo runby. 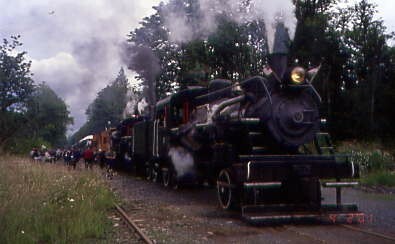 The engines begin to back for the runby. Photo Runby 1. After the train backed for the second runby, I crossed the tracks for a view from that side. 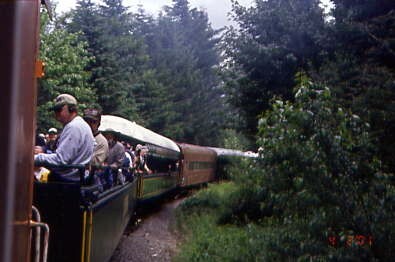 Joan Reed-Nickerson, the General Manager of the Mt Rainier Scenic Railroad, asked if anyone wanted to use the bed of her truck for some elevation. I took her up on it and she backed up right behind the photo line where one other person joined me for Runby 2. 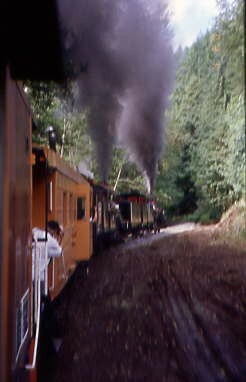 Once we all were reboarded, our train began the descent towards Morton. 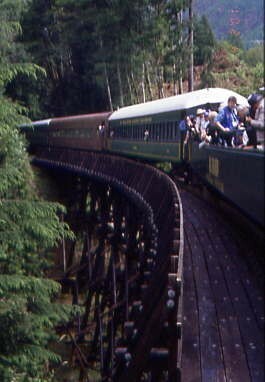 Our train crossed the first spectacular curved wooden trestle. We then continued to twist and turn down the grade. 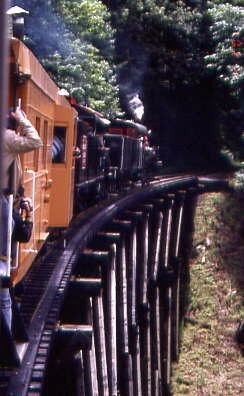 After MP 60 the train crossed the second curved wooden trestle. 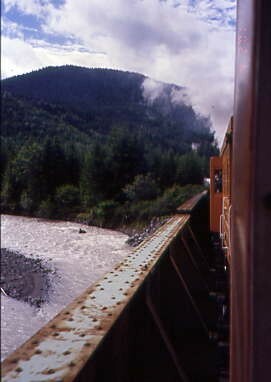 Our train continued down the grade as we neared the valley where Morton is. The photographers were out in force following our special train. 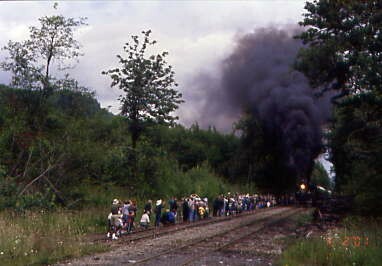 Minutes later, our train came into the yard at Morton. 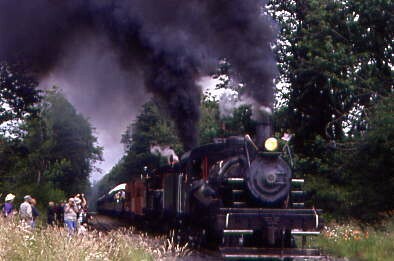 The Westport Timber Co. Heisler 91 cut off from our train to be wyed. 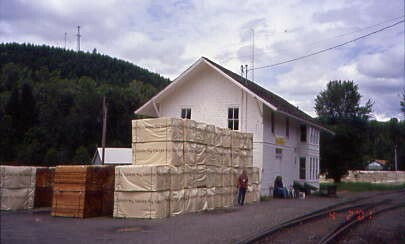 Once the Heisler had cleared, we then pulled towards where our train would be unloaded. We passed the Heisler as we pulled forward as it was still going around the wye. Our train pulled into the unloading area and here I detrained from the caboose onto the first bus that took us to the Morton Community Center. Here I enjoyed a picnic chicken lunch and met Joe Harper. After lunch Joe drove me back over to the Morton Depot which we toured. 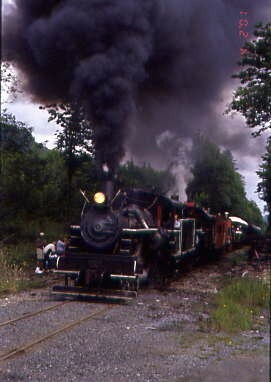 The Heisler returned to the rear of our train to pull it clear so the Climax could escape and run to the wye. 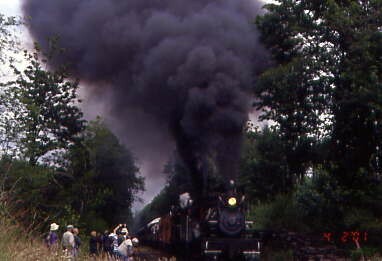 The Climax would lead our train back north. 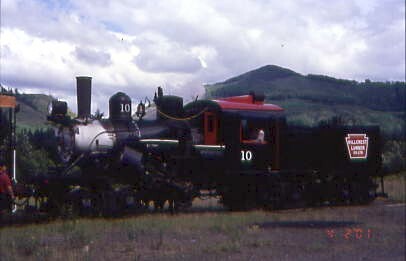 It was now the Hillcrest Lumber Climax 10 turn to wye. 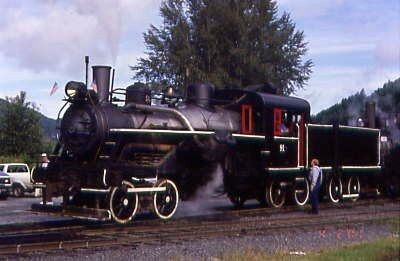 I got the train consist before I reboarded the SP 1751 at the Morton Depot. 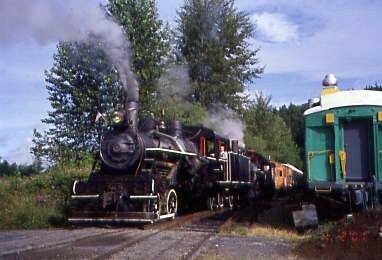 I worked on the story before the train backed to the loading location for our northbound trip. Chris Parker joined me in the caboose for the trip back. We left Morton at 2:45 PM with a train load of happy and well fed passengers. On our way out of Morton we passed this view before we began the climb towards Divide. 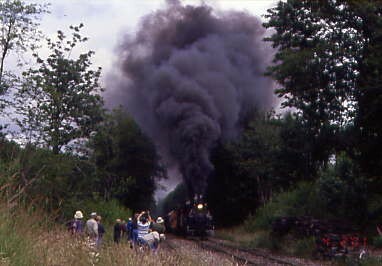 The smoke proved our engines were hard at work climbing the grade to Divide. 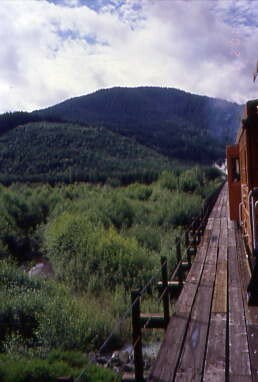 A few minutes later we were crossing the second curved wooden trestle again. 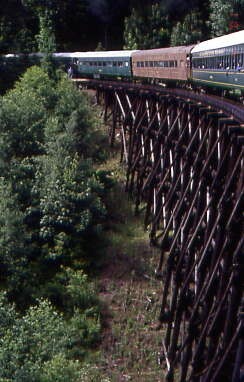 Next highlight was the crossing of the first wooden curved trestle. 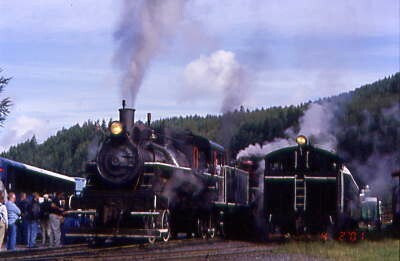 Another stop was made to service our two steam engines. From here we ran to the yard at Mineral. 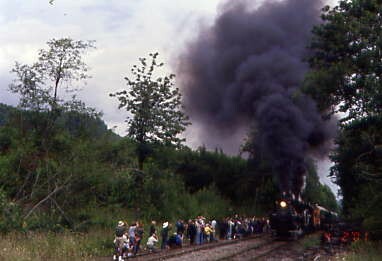 Our timing was perfect as the regular excursion train had just finished going around the balloon track. Our crew called him on the radio to ask him to run by us giving us a Photo Runby of him and their passengers a Photo Runby of us. Cameras were clicking away on both trains. 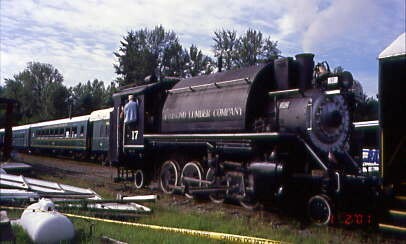 The Hammond Lumber 17 put on a fantastic show for our passengers. 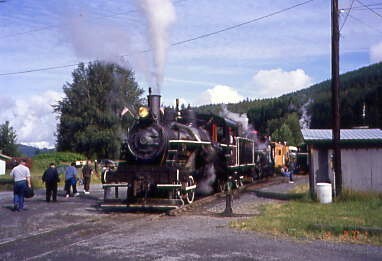 Once that was done the excursion train run back to Elbe and we headed to the switch to the shop. Here the Hillcrest Climax cut off and backed into the shop led. 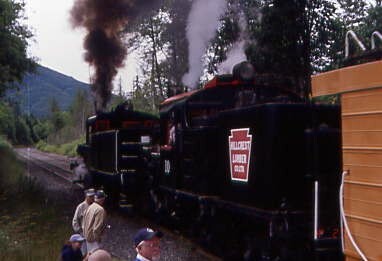 Once our train was pulled clear of the switch, the Climax coupled to our rear end and took the train towards the shop. 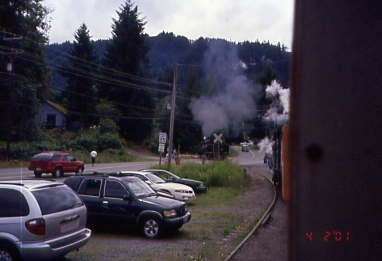 Our train approaching the Mt Rainier Scenic Railroad Shops. I detrained and took the front seat in the bus for the return trip to Portland. I jumped off the bus for this last quick shot of the Hillcrest Lumber Climax. 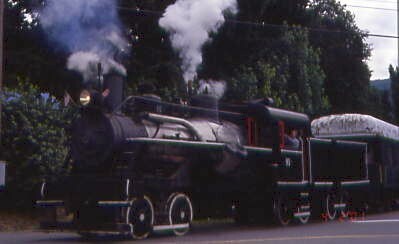 Chris Parker joined me on the bus and we arrived in Portland at 7:15 PM ending a fantastic 2005 NRHS Convention hosted by the Pacific Northwest Chapter of the National Railroad Historical Society. I had dinner at Quiznos before Maxing back to 82nd Street and the Days Inn. About an hour later Bob returned to the hotel and we shared how our days went. One word said it all for me, "Fantastic!" We called it a night.